Everyone needs a creative outlet. I happen to get mine through cooking, through scrapbooking (yeah, like I have time for that! ), and through my children. One example of when I get to be creative is at my children's birthdays. Each year we have a theme selected by the kids (okay, we select them when they are young, but base it on their interests). Together, my husband and I come up with an invitation. This is usually me finding samples, examples and suggestions on-line, based on the theme and him putting together the actual invitation. Then, I bake and decorate a cake based on our theme. 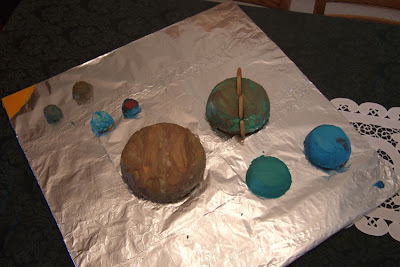 Just this past weekend we had an outer space party for my now 5 year old son. We created invitations in the form of a recruitment letter to join our mission leader (the birthday boy) on a space mission. The recruitment letter came complete with an official badge for each invitee to allow access to "restricted areas".